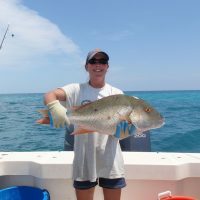 Whether you are looking forward to fishing the mangrove shorelines, flats or even a freshwater destination, Tampa Bay, FL, has plenty of fishing hot spots to select from. Here are top 5 fishing locations in Tampa bay, you should try. Perched along the mouth of Tampa Bay, Bishop’s Harbor will offer you some of the best fishing opportunities in Tampa for trout, snook and redfish. This spot consists of shallow flats and mangrove shorelines that are prime habitats for popular saltwater inshore species. Study a local tide chart and your last few hours of an incoming tide can be the most productive. You can access this spot by a sand boat ramp situated off of Bishop Harbor Road in the Palmetto city. This has long been the top Tampa Bay angling hot spots thanks to the two easily-reachable fishing piers on the Tampa Bay and Gulf of Mexico. The Gulf Pier provides access to open waters which means stronger current with heavier gear for species like king mackerel, Spanish mackerel and sharks, whereas Bay Pier is a rather sheltered spot where you can try family fishing with light gear for snook, trout and redfish. This is a perfect fishing spot, just like you might have dreamed of. A fishing pier of a couple of miles in length (of which the Palmetto side is 1 ½ mile long and the St. Petersburg side is half-mile long) lies before you and can offer you opportunities to catch exciting species like tarpon, snook, Spanish mackerel, pompano, sheepshead and cobia. The best thing about this spot is that it’s open all through the year, 24 hours a day. Admission fees apply. Along with the Tampa Bay hot spots perfect for saltwater kayak angling as mentioned above, remember that there are some outstanding freshwater hot spots here too. Don’t miss fishing at Edward Medard Reservoir in Hillsborough County for sunshine bass and largemouth bass. As the reservoir is a retrieved phosphate mine, its bottom is irregular with some spots with a depth of almost 33 feet. These irregularities make it one of the best freshwater fishing spots in Florida. If you are dreaming of catching a trophy bass in Tampa Bay, you should head to Lake Tarpon. Actually the lake is considered to be one of the top ten bass lakes in Florida by the biologists at Florida Fish and Wildlife Conservation Commission. Try fishing the offshore structure and points on the lake during the warmest hours of the day all through the summer. So, as you now know the hottest fishing spots in Tampa Bay, what are you waiting for? Get your gear and go ahead for the best catch!